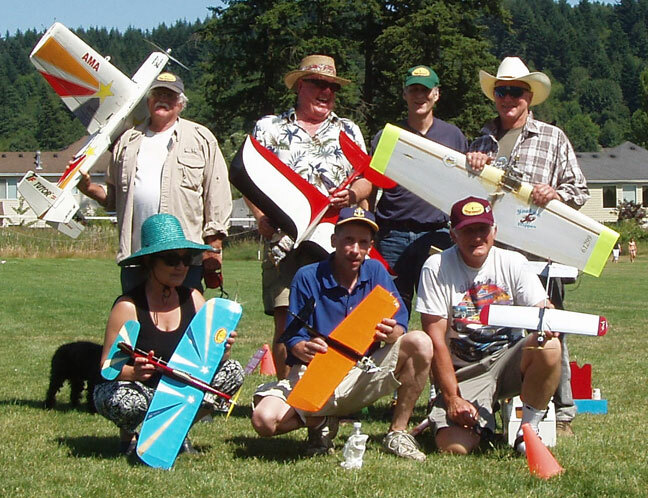 The Northwest Fireballs control-line model airplane club is based in Portland, Ore. 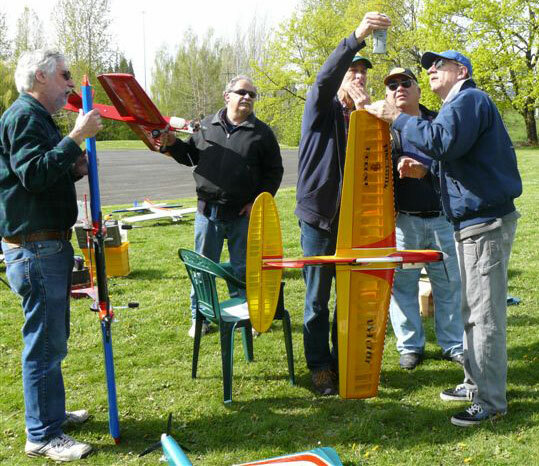 The members fly several times a week at the Jim Walker Memorial Control-Line Flying Field at East Delta Park, where the club also hosts the annual Jim Walker Memorial Spring Tune-Up event every April. E-mail for information about flying activities. For more information about Jim Walker and his American Junior Aircraft Company, visit the American Junior website. 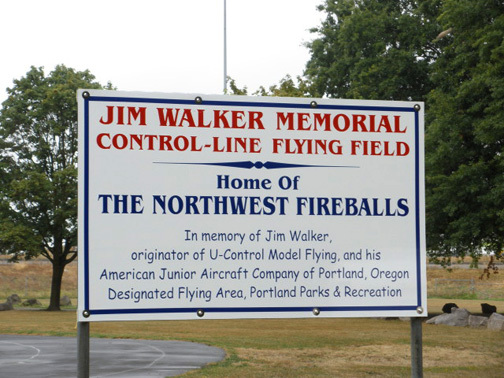 The Fireballs have been out practicing in Delta Park on every nice day in spring 2015, getting ready for the Jim Walker Memorial Spring Tune-Up, coming up on April 17-18-19. See Where the Action Is for details. At the field on April 1 were Dave Royer, Richard Entwhistle, Don Curry, Terrence Bardue, Leo Mehl, Doug Powers, Scott Riese, Ron Anderson and Jim Harper, along with visitor Fred Underwood and a couple of other visitors whose names we didn't catch. Jim Harper photo. 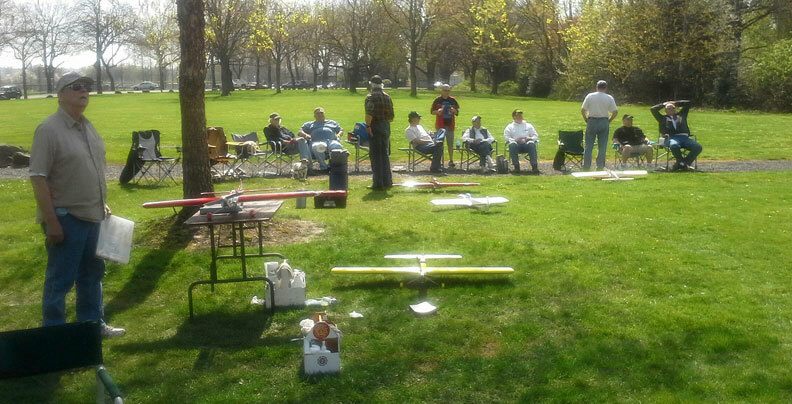 Portland area fliers meet Mondays, Wednesdays and Fridays (with occasional weekend flying) at East Delta Park. There's usually a good group on hand, sometimes a dozen or more. On a recent Friday, these Fireballs members modeled their new hats. Geoff Christianson photo. The Northwest Fireballs flew their second annual demonstration on July 4, 2009, at Happy Valley Park near Portland. Pictured are (back row, left to right) Richard Entwhistle, Jim Harper, Jerry Olson and Gary Harris; (front row) Irene Heen, Jim Cameron, Doug Powers. Not shown are Mark Hansen and Barbara White. See article. Barbara White photo. 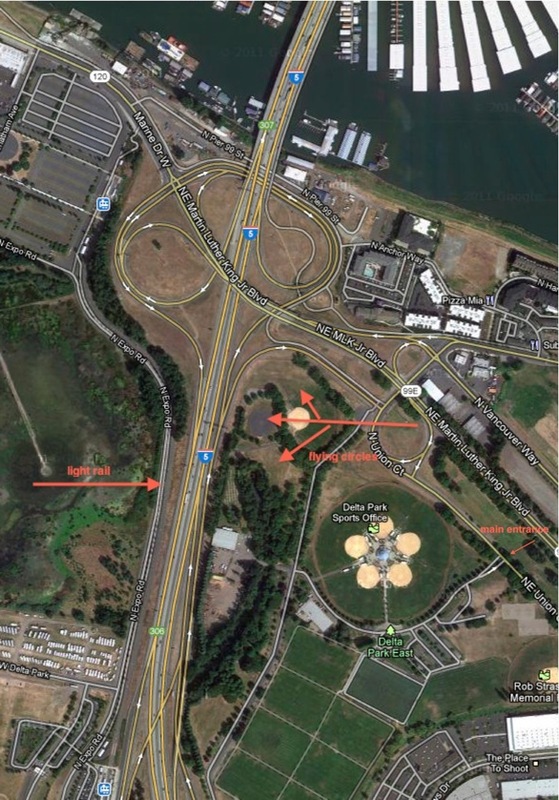 Here are the Fireballs attending the March 13, 2011 meeting at Doug Powers' house. Left to right: Scott Riese, Leo Mehl, and (on the sofa, behind Leo) Jerry Olson, Doug Powers and Mark Hansen, Bill Lee, Ron Anderson, Jim Cameron, Alice Cotton-Royer, Dave Royer, Jim Harper, Don Curry and Richard Entwhistle. Fireballs photo. The pleasant setting at East Delta Park in Portland, Oregon, is the site of the annual Jim Walker Memorial Spring Tune-up contest (a stunt flier performs on the asphalt circle, above) and other organized flying activities through the year, as well as regular informal flying sessions. 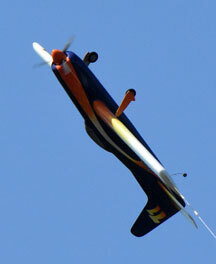 In photo below, a Fireball member does a final pass on the grass flying area before a contest. Leo Mehl photos.